Enchanted series now widely available! We are excited to announce that now, in addition to being available on Amazon, the entire Enchanted series is now also available at all your other favourite book distributors! 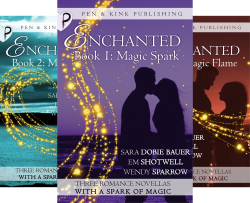 Now you can enjoy magical romance by Sara Dobie Bauer, Em Shotwell and Wendy Sparrow from Barnes and Noble, Kobo and more!